A Good Samaritan helps take Jackson Lajul’s body to hospital. Photo by David Okema. Police in Gulu District are hunting for a fuel tank driver suspected of knocking dead a security guard at Layibi Custom Corner on Gulu-Juba highway yesterday. Jackson Lajul 60 was crushed beyond recognition as he headed to Gulu School of Nursing where he had been deployed. Aswa region police spokesperson Jimmy Okema said police have arrested two drivers in connection with the Friday incident. They include Ibrahim Salat, 29, who was arrested from Elegu and Abaihukur Ussen who was arrested from Pabbo trading centre. 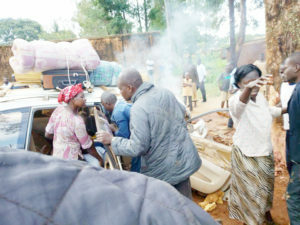 Okema lashed at drivers who flee after causing accidents. By press time, Lajul’s body had been taken to Gulu Regional Referral Hospital for post-mortem examination. Last week, six people escaped death on the Gulu-Juba highway at For God trading center after the vehicle they were traveling in collided with another vehicle that was joining the main road. Aswa region police spokesperson addresses journalists yesterday. Photo by David Okema. Reports indicate that the Aswa region police has registered more than112 accident cases in the eight districts of Gulu, Kitgum, Pader, Agago, Lamwo, Omoro, Amuru and Nwoya since the beginning of the year. Okema said Gulu District registered more cases of accidents involving boda bodas compared to other districts in the country. The report released last month shows 18 fatal cases were registered, involving eight motorcyclists, six passengers and four pedestrians. Okema attributed the raising cases of road carnage to reckless driving, speeding and poor road usage. The report also indicates that Gulu currently boasts more than 4,000 boda boda operators. Last month, Gulu traffic police department carried out an operation in which more than 30 vehicles under dangerous mechanical conditions were impounded.